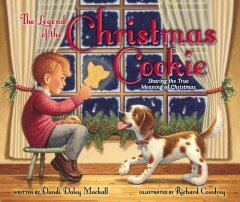 "The Legend of the Christmas Cookie -- Sharing the True Meaning of Christmas" by Dandi Daley Mackall is a beautifully illustrated book with a sweet and thoughtful story. This book tells of young Jack who learns the story of the Christmas cookie and the blessing of sharing God's love with others. Spoiler alert -- Jack gets the opportunity to share God's love (and his special cookie) with a traveling stranger. Each Christmas cookie is made using an intricately carved wooden mold, as in the Middle Ages. It would be great if a set of these molds were for sale to go along with the book. I have a wooden mold from New Zealand of a kiwi bird and so I have seen firsthand how interesting the cookies made from wooden molds can be. For those of you who bake, there is a recipe included in the book. It seems that this book is intended for those who are already familiar with Jesus' birth and with why Jesus came to earth. So -- the true moral of the book is for those who DO know to share God's love and Jesus' gift of salvation with those who don't yet know. Overall, this is a sweet and inspiring story that will encourage those who believe to reach out to those around them. If you have any questions about Jesus' birth and the reason for it -- please don't hesitate to ask a question in the comments below or e-mail me. I would love to tell you more about God's love for you.